Azure DevOps. Formerly Visual Studio Team Services (VSTS), Visual Studio Online (VSO) and Team Foundation Service. Azure DevOps Server. Formerly Team Foundation Server. Visual Studio has been around for a long time and there are still people developing in Visual Basic 6 or Visual Studio 2008. I sincerely hope these people store their sources securely, because these old IDEs and codebases will be causing them enough headaches. Even if you're using a more recent IDE, you could need one or more hotfixes and/or service packs. To connect your IDE to Azure DevOps you usually need to make sure you have Team Explorer or an extension to your IDE installed. Team Explorer ships with Visual Studio in recent versions, but in older versions it was a separate installation. Note that for many of the items listed below, the order of installation is important. If you've previously installed any of the packages you'll need to uninstall them first or repair all packages in the order listed. Microsoft has an official Client Compatiblity matrix. In addition to it, this post also lists the required hotfixes to make everything work. 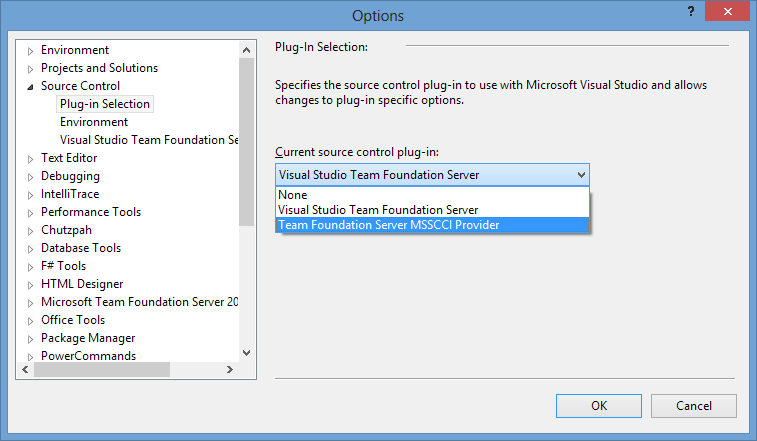 If you also want to install the Team Foundation Server Power tools to match your Visual Studio/TFS version, check out this separate post. Git is supported by default. Do not use the Team Explorer tab or the Team sub menu to connect to TFS, instead use File, Source Control. Connect using the http://server:port/tfs/ProjectCollection url format for Team Foundation Server. Connect using the https://[account].visualstudio.com/ or https://dev.azure.com/[account]/ url format for Azure DevOps. How to install TFS Powertools Side-by-side. Then go to File, Source Control to open a project from source control. interact with these features from Visual Studio. When you use Visual Studio 2012 or higher to configure your Version Control mappings, you need to make sure you select a "Server Workspace". 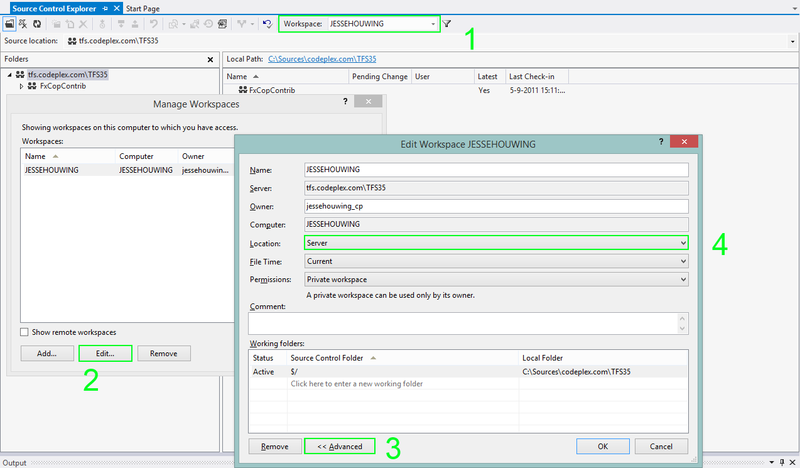 Change workspace location to Server. Picture used under Creative Commons. Thanks to XKCD.